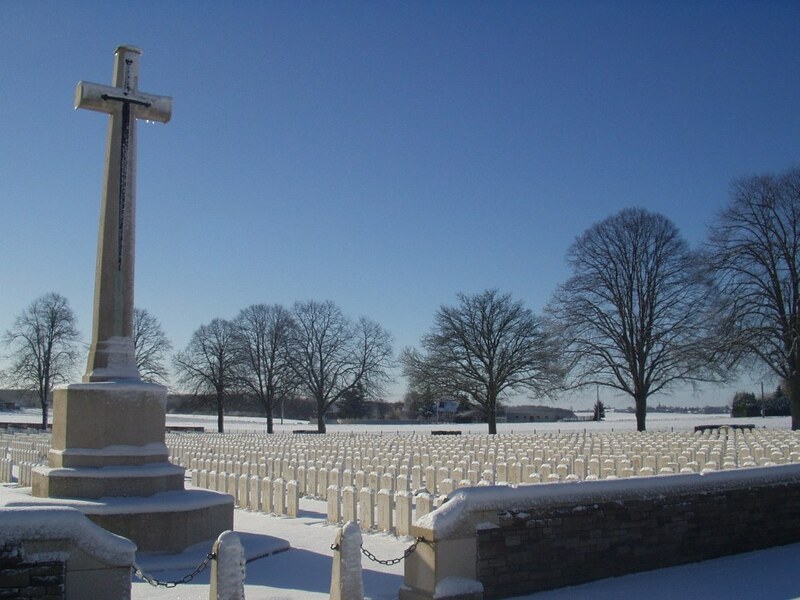 DELVILLE WOOD CEMETERY, made after the Armistice, when graves were brought in from a few small cemeteries and isolated sites, and from the battlefields. Almost all of the burials date from July, August and September 1916. MARTINPUICH GERMAN CEMETERY No.1, at the North-East end of the village, which contained the graves of six British soldiers and one sailor who fell in March 1918; MARTINPUICH GERMAN CEMETERY No.2, to the West of No.1, which contained the grave of one British soldier. There are now 5,523 burials and commemorations of the First World War in this cemetery. 3,593 of the burials are unidentified but there are special memorials to 27 casualties known or believed to be buried among them. Other special memorials record the names of three soldiers buried in Courcelette Communal Cemetery German Extension, whose graves were destroyed by shell fire.